Oh boo... no one took me up on my challenge of quilling a king or queen using the new U.S. love stamps as inspiration. But that's okay, I promise we'll do another blog candy contest at some point in the future. I heard from some lovely readers who wanted to give it a go, but just didn't have the time right now - perfectly understandable with spring and fall activities at this busy time of year. And to prove I don't harbor any ill will, have a cookie, won't you? :-) Isn't it pretty? Delicious too, no doubt! 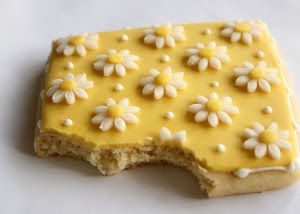 Take a peek at the delightful Better Bit of Butter site where there are scads of beautiful cookie designs. I'm pretty positive your artistic mojo will be inspired in no time. Quilling the king and queen in that stamp? Gasp! That sounds so difficult. Hi - thanks for commenting. Well ermmm, the design could have been a very loose interpretation - I really wasn't looking for replicas. People of all skill levels visit here, so they could have made it as complicated or not, as they wished. But I hear what you are saying... next time I'll go with something less intimidating.